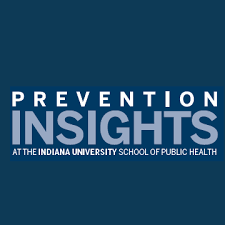 The IPRC was originally envisioned to promote and sustain healthy environments and behaviors across the lifespan in Indiana, but now the IPRC’s ambitions have grown beyond the borders of Indiana. In becoming Prevention Insights, the public health organization has set its sights on promoting and sustaining healthy environments and behaviors across the lifespan in every community in the U.S.
For 30 years, Prevention Insights has built a reputation of integrity, dependability, and innovation working with state governments, local governments, community coalitions, healthcare providers, schools, and other organizations involved in the pressing issue of helping people prevent and alleviate public health concerns. This broad spectrum of experience allows Prevention Insights to understand, anticipate, and mitigate issues that can block the successful implementation of evidence-based programs in varying real-world conditions. The organization works to bring together research and practice and thereby better ensure that individuals and communities receive state-of-the-art prevention technology. Prevention Insights is equipped to take the lead on substance misuse, mental health awareness training, Motivational Interviewing training, workforce development, workplace wellness and thrive training, technical assistance, program evaluation, staff or coalition-focused continuing education, Screening, Brief Intervention, and Referral to Treatment (SBIRT), and other prevention intervention initiatives.